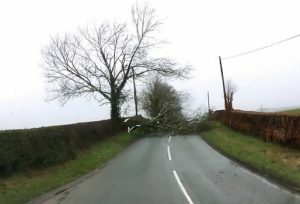 Almost all vehicles are affected when driving in strong winds. During extreme weather conditions always consider whether your journey is essential and if possible postpone it for a calmer day. If postponing your journey isn’t an option, or you’re unfortunately caught up in extreme weather whilst out on the road, the following tips allow for driving in strong winds to be as safe as possible considering the conditions. Firstly, always consider that driving in strong winds will not only destabilize your vehicle, but the vehicles of other road users and will also impact on the environment. Secondly, remain alert by observing your surroundings, other vehicles around you and by keeping to an appropriate speed based on the conditions. Predict gusts – High winds come with strong gusts so if possible, keep to a route which is sheltered, preferably by buildings. If you are entering an exposed area such as open countryside or a bridge, anticipate strong gusts. To minimise the impact on your vehicle and to regain control in the event of a strong gust, slow down and keep both hands on the steering wheel. High-sided vehicles – HGV’s, lorries, large vans, buses, vehicles towing caravans or anything with a higher centre of gravity is less stable than most cars. High-sided vehicles are at greater risk of instability which may cause them to swerve. Avoid overtaking if possible, or wait for a stretch of road that is more sheltered. See driving near large vehicles for further driving safety tips. Vulnerable road users – Cyclists and motorcycle riders are particularly vulnerable in windy weather conditions. Strong gusts, even in sheltered urban locations can cause these road users to swerve. Give them plenty of room and only overtake when there’s plenty of room to leave them. See vulnerable road users for safe driving tips. Following distances – The 2 second rule allows drivers a safe stopping distance and should be followed by all road users in good weather and road conditions. Vehicles that are hit by gusts of winds may need to slow down abruptly. Consider extending this to a 4 second rule. Country roads – country roads offer one benefit in that they’re often shielded from winds due to trees and hedges. This benefit can turn hazardous when trees fall. Be particularly cautious on bends where debris may be in the road, but also vehicles may be on your side of the road avoiding fallen debris in their path. See country road driving for safety tips. Keep your speed down – driving slowly may seems tedious but your vehicle will be considerably more stable because of it. 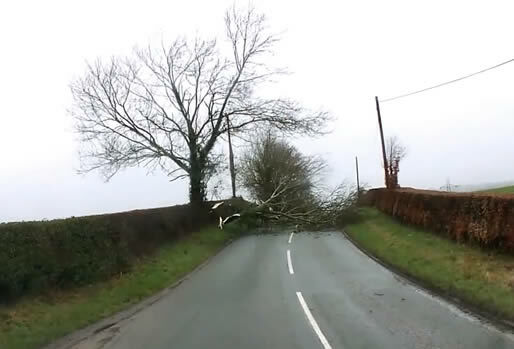 Road debris – Branches, fence parts – even wheely bins can make up the debris found in the road after high winds. All of which can cause damage to your vehicle or worse still and accident.